is a member who participated in the foundation of the society or appllied to it and the committee accepted him. He has the right to participate in the general assembly of the society and to apply to be elected as a member of the committee. is a member who do not have all the conditions of the active member and the committee decided to accept him as an attached member. is a member who offered good services to the society. He do not have the right to be elected as a member of the committee or to attend the general assembly. The applicant should be of good conduct and behavior. The applicant should be of the workers in the field of Cardiothoracic Surgery. The applicant should have a master or MD degree or their equivalents in Cardiothoracic Surgery or related speciality. The applicant should fill an application form and present with it the application fees of 10LE to the society. The application form should include the name, title, age, nationality,mobile number, adress, e-mail, institution and way of payment of annual fees. The application fees payment is not a document of acceptance of membership. The committee board will decide whether or not to accept the applicant. Resignment from the society: The society should be notified by a formal P.O. letter and the member should pay all his financial dues to the society. Loss of any condition of membership. If the member commited an act that harms deeply the society. If he uses memdership for personal offensive affairs including professional or ethical misconduct.. If his dues of membership fees are in arrears for more than 12 months. The society shoud inform him by a formal P.O. letter within the next 4 months. If the member was accepted during the year, he pays a sum equivalent to the remaining part of the year. Print the application form on this website page, fill and sign it. A copy of the certificate last sceintific degree. A copy of the certificate of the place of work showing the present title. Incude the application fees of 100LE. 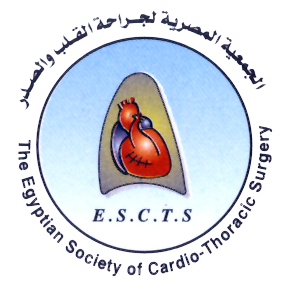 The Egyptian Society of Cardiothoracic Surgery.